"This dessert recipe came from a friend from England, Gill Overfelt. She is one of the best people in the world (an angel in disguise!). It is delicious and elegant looking layered in a trifle bowl or individual dessert glasses." Slice strawberries and sprinkle them with sugar. Cut the bananas into slices and toss with orange juice. Combine pudding mix with milk and mix until smooth. Cut the cake into 1 inch cubes. Use half of the cake cubes to line the bottom of a large glass bowl. Layer half of the strawberries followed by half of the blueberries, and then half of the bananas. Spread half of the pudding over the fruit. Repeat layers in the same order. 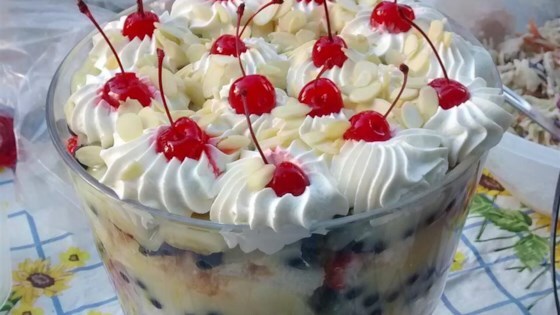 In a medium bowl, whip the cream to stiff peaks and spread over top of trifle. Garnish with maraschino cherries and slivered almonds. This elegant dessert features layers of cake, vanilla pudding, and fresh fruit. This is a yummy dessert, it makes plenty and is a crowd pleaser. It does not get mushy if you refrigerate over night overall it is a very light, summer dessert. This was very good, light, and easy. I only used one layer of the cake, though, and that was plenty. Otherwise, I think the fruit and pudding would have been lost. Great recipe, however I made homemade pudding and homemade cake both from this site and the result was out of this world, well worth the effort.Thanks for sharing.